The refreeze in the ESS/North of Chukchi is masking lots of sudden movements, which seem to have a net negative effect on extent when eyeballing the animation. So the increases in extent seem to me to be mostly wind driven at the moment - melt has mostly stopped, refreeze is starting up, but the ice continues to move around. I have felt this way for the last few years. I visit daily all year round and am disappointed that many of the experts here don't comment as often in the winter. Is there any sort of DMI-like graphic that shows temps outside of 80-N? Pure SPECULATION but it 'seems' that GW's extreme temps in the summer vs. the still relatively cold arctic sets up a stronger temp difference and thus stronger Jetstream in the summer but as soon as fall hits, I have to assume the difference between lower latitude temps vs. the arctic must be less, and therefor a weaker jet allows warmer air to flow north. I have to assume that NH winter temps are less of a diff. to the arctic than summer??? Is there any sort of DMI-like graphic that shows temps outside of 80-N? that NH winter temps are less of a diff. to the arctic than summer??? 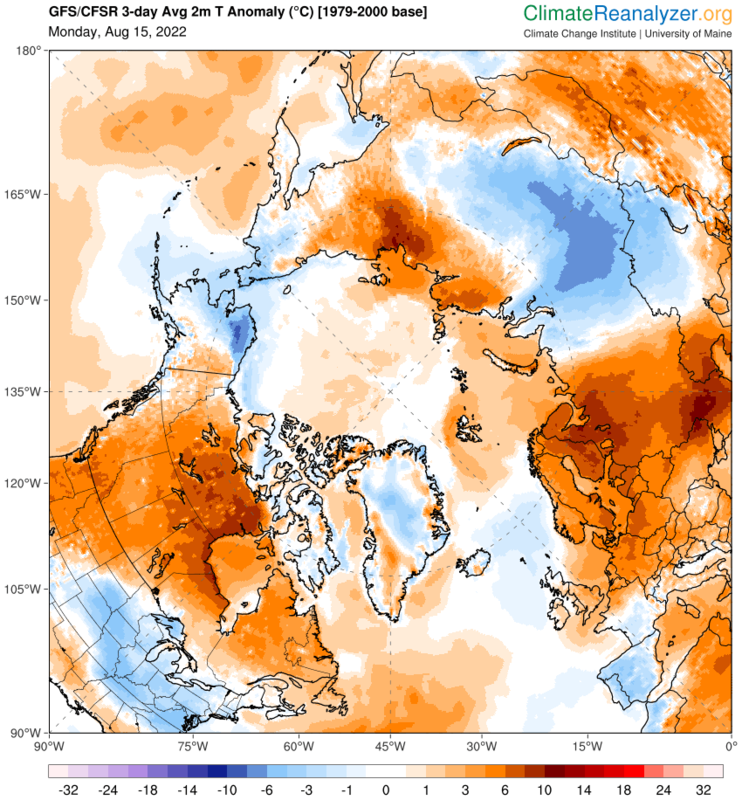 temps in the high Arctic continue to rise . Accordingly , today's dmi80 is over 8'C above average , again a record . Another way of looking at it .. temps are where they should have been 22 days ago . Perspective .. the all time dmi80 record anomaly was last Feb .. @ 21'C b.c. ps Worldview today shows the Siberian arm of ice beautifully ! Worldview also shows catastrophic losses along the ATL front NE of Svalbard (near whatever those other islands I am not Googling at the moment are called). The retreat over the past few days has been dramatic but accelerated even more today. Above-freezing winds at 68 km/h now crossing 80 degrees N latitude & driving waves into the edge of the ice pack. 0z EURO says this thread is fake news and the melt season is far from over. DMI confirms imminent rapid Laptev retreat and very substantial front movement elsewhere as well. Truly insane! But equally absurd are the anomalies flanking the NATL. I could also see both The Thames and The Hudson freezing synchronously for the first time since... the 1700s? But that probably pales in comparison to how far we would have to go back to get year-round ice-free Bering, which is seemingly plausible this year / next. Will you take this back and apologize if you turn out to be wrong? JAXA had another 18K uptick and is now almost 250K above the prelim. I say, Neven, does that mean you don't think the Thames is going to freeze over ? And I was just about to ask NSIDC to add the North Sea and English Channel to their list of Arctic Seas. Well, a temperature anamoly in the pacific-side isn't that weird. In the '80-'10 period that part was mostly frozen during this time of the year, so temperatures won't go easily above freezing point, because of the ice. So the average over a 30 year period will be low, because there will be almost no data points above 0 degrees. Thus there is no normal distribution of the data points. The upper part is non-existent, so the average is 'too' low. Since there is no frozen ice in that part, it opens up the possibility for far higher temperatures. And for short periods you will alway have huge deviations of the average. Today it can be 10 degrees above average, next week it can be 10 degrees below. And 1000 km to the south it can be the opposite situation. But if it's 12 degrees higher and 8 degrees lower, than it's on average higher, which is much more serious than just a snapshot. So when i see those maps I always think "Wow, that's hot/cold compared to average, but it's only a snapshot"
I could also see both The Thames and The Hudson freezing synchronously for the first time since... the 1700s? I don't really get all the hullabaloo re. 850 HPa charts. As far as I understand it (and it's admittedly a very low level of understanding), 850 doesn't have any direct bearing on surface temperatures, but is mostly used to show location of airmasses which indicates where fronts/lowpressure areas are to be found. Given that the Arctic has become much stormier in the last few years, it shouldn't really come a surprise that 850 HPa values are far away from long-time averages. And thinking that the Thames is going to freeze over based on an 850 HPa prediction one week out seems just silly - the Met Office certainly wouldn't agree, with max predicted London temparatures around 19 degrees centigrade on October 6th, which is slightly above average. Agree it's at least possible. Most of the extent gain appears to have come from some of the slush regions on the Pacific side - more specifically, north of the Bering & Chukchi seas - that is now registering as ice. It hasn't even been that cold there - just -3 or -4 degrees C - nor that still. If the wind picks up there then much of that new ice could flash back to registering as sea and the extent could potentially drop again. Conceivably even to a new minimum! Looking at the actual 2m temperatures the only area where refreeze is likely is around Ellesmere Island and along the North-Greenland coast. Any leads in this area will presumably freeze over. Melting is presumably still ongoing around the perifery, where air temps are around or even above 0 degrees, but at a much slower rate than previously. The increases in extent that we have seen are mostly wind driven, and would be considerably bigger if the Atlantic front north of Svalbard - Franz Josef Land wasn't being driven significantly back. The only place outside CAA where there is significant and visible increase in extent when looking at the various maps is the tongue of ice creeping into the Beaufort, presumably wind-driven since the temps are nowhere low enough for refreeze there. So changes in wind direction and the continuing peripheral melt could quite concievably result in drops in extent - but a drop of 200 km2 or more to match the minimum seems pretty wild and as far as I can see totally without precendent in previous years. NSIDC Daily Extent UP by 99k. 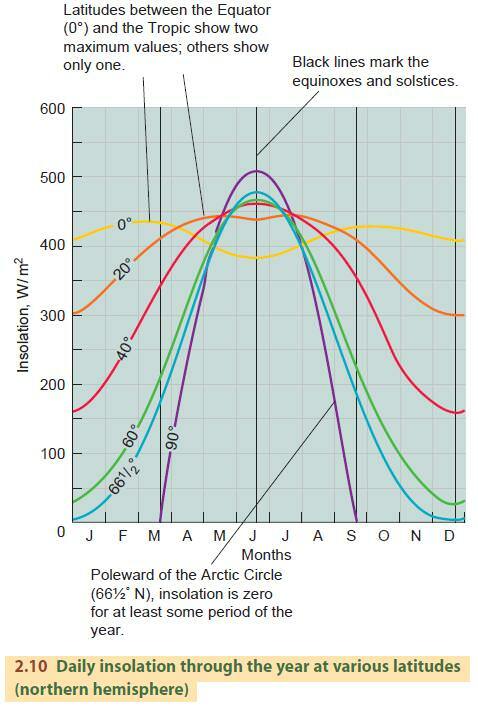 Only the Central Arctic Sea shows area (5 day trailing average) loss of any significance on the 27th (25k). See 2018 extent thread. Yeah, getting back to minimum is going to be tough. We could very well see some drops (and probably will starting in 48-72 hr when the main push of WAA makes its way into the basin), but making up 300-400k is gonna be tough. The bottom line is that this year is quickly going to retreat into last place. By how much is the question. Neven is probably going to be right. But I do think we could still see a decent decrease and indefinite stall in extent. The only real gains imminently will be across the CAA. In fact, the first new ice is now forming across Foxe Basin, which is expected to dip below freezing in its entirety by D10 according to the EURO. Profuse assumptions are being made. We cannot assume the atmospheric temperature profile under areas of high pressure at 850 MB or 500 MB, will correlate to the surface being as anomalously warm, as it would during northern hemisphere summer. It is probable, there will be a layer of closer to average temperatures near the surface, than at higher altitudes, due to less solar isolation (less surface heating) and a cooler surface. I predict northern hemisphere sea ice extent and area will continue to increase, albeit with a slower increase than average. The 850 MB and 500 MB anomalies are not indicative of the actual surface anomaly after northern hemisphere summer. The decrease in cloud thickness / coverage under high pressure, should also allow for more heat energy to radiate into space. This could also increase the heat anomaly at 850 MB and 500 MB. Anomalous connected temperatures as high as 10+degC over average, are predicted to swamp the North Pole, including all(?) of the Arctic, Alaska, far eastern Siberia, eastern Russia & some climes further south, while anomalously low temperatures will cover much of Canada, mid-northern continental U.S. & northern Greenland. Hopefully, the miserable cold temperatures of Canada won't be a repeat of the long enduring, previous winter Canadian cold of last year. WACCy...Warm Arctic Cold Continents. I think the cold is going to be only relative, but in comparison it will be clear within a few years. One can ask why the Pacific side has started to re-freeze even though temperatures are nowhere near as low as the -10 degrees C often stated here as the rule-of-thumb temperature when refreeze starts. A factor I haven't seen discussed here is the clear skies on the Pacific side - as seen in the Worldview screenshot in my previous post. Re-freeze is due, not to low temperatures, but to loss of heat. A clear sky facilitates loss of heat from the water as thermal radiation. That is why ice can form on a puddle on a cloudless night even when the ground temperature is above freezing. In my understanding, thermal radiation is likely to be a large, perhaps dominant, contribution to the re-freeze on the Pacific side. 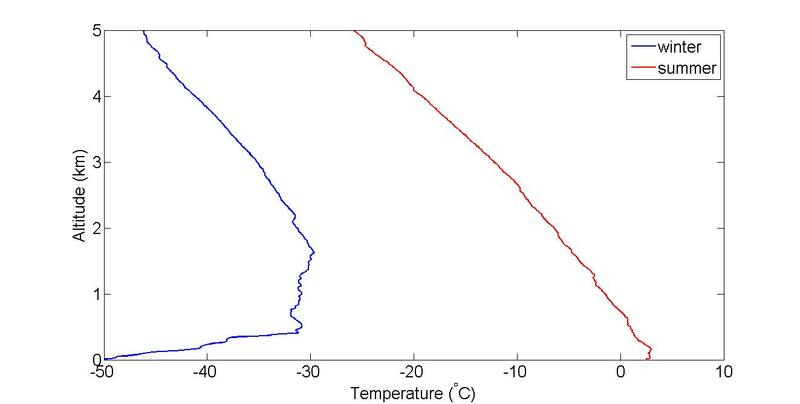 Are the contributing components to heat loss modelled in some of the predictive models for the Arctic? If so, what average percentage is thermal radiation direct to space? I remember Jim Hunt stating a year or two ago when ice was forming at record pace that that was a bad thing because it didn't permit heat to escape from the arctic ocean as well as open water. Therefore, the slower refreeze we are seeing now, being the very opposite, should be a good thing later in the season because more open water means more escape of heat from the arctic ocean. I suspect that after the late melting in this region, the top layer is fresher and therefore more prone to early freezing and less conductive to full mixing of the water column when cooled from above. Agreed, and the current weather is very favourable to compaction as well. Is not that but one half of the equation? Two opposing forces working against each other. Which will prevail? Perhaps much will depend on the available store of ocean heat to be lost. Looking at Arctic Ocean SST anomalies suggests to me to keep the closest watch on the Bering and the Chukchi. In the 2017-18 freezing season, the Bering Sea at maximum was barely 50% of "normal". I don't see this as some kind of welcome negative feedback, but simply as a consequence of having more heat in the system. Similar to the way a warming planet emits more heat to space thanks to black body radiation, this doesn't save us, but is rather a natural byproduct of the warming process. I suppose we'll see what this means for 2019. It's interesting to note that NSIDC extent's post-minimum refreeze has very closely followed 2011's--and 2011 was of course followed by 2012's recordbreaking melt. It's also interesting to note that 2018's to-date average extent is second lowest on record, behind only 2016, and slightly lower than 2nd and 3rd place holders 2017 and 2012. "One can ask why the Pacific side has started to re-freeze"
It looks more like the ice is expanding/rotating into the Pacific side. Near the center of the ice cover there are desert conditions, bone dry air - freezing winds, whenever a crack opens it instantly freezes over, that slowly but surely expands the pack. As it moves south it loses ground to the planets rotation, about 25k per deg., in order to bypass the CAA shoreline it would need about another 10k. Tidal movement has been keeping the ice from becoming fast, thus every few hours it moves a little further south. Between the pole and the center of the pack the conflicting pressures forcing the ice in different directions adds to the number of leads to be flash frozen. On the Atl. side there's too much heat and too much wave action to allow the pack to expand, though nothing to stop it's exit through Fram. There appears to be a warm current flowing beneath Beaufort, from the NSI towards Lancaster/Amundsen keeping central Beaufort from freezing, and allowing wave action to continue on that front. That current seems to be associated with a feature around 77N 172W. On hycom 'ice opening' it looks to be pulsed from below, possibly connected to tidal surges, creating massive shallow waves which are impacting the melt of ESS On 'sss' it shows up as fresher water/melt I'd expect more saline from below, so is the melt being forced south from beneath the ice? and although it mainly rotates ccw there are signs of counter rotation suggesting two different energy signatures. This is the last day I expected any downturn so if any of this is relevent the freeze should gather pace come monday. Yep, one has to carefully see what the heat balance is, and if the refreezing is being delayed by external input of heat (like today) or purely by heat release from a very bad season as 2007 and 2012.
no, last year was very slow and was not followed by any higher max at all, on the contrary. just look at the 2017 graph and one can see that the opposite happened while i'm not saying that it's directly related but then there is so much excess heat in both, water and air that it does not matter a lot anymore. of course weather conditions have to play along, it's stil possible that an outlier on the high side occurs but then that as well would not be directly related but due to weather patterns. the heat is on and does not go away because of that fraction of higher see surface when we look at it globally and i still am of the opinion that regional events mostly have to be seen in the global context. ..... except in regions with strong downwellings, where slightly warmer solar heated waters(which used to be solar-reflective ice), instead of remaining at the surface, have been forced to deep waters, either on continental shelves or even into ocean depths, for long-term storage..... until future release from ocean circulation patterns into the atmosphere. Interestingly, I notice the ESS has some new ice winking back out. Meanwhile, the Greenland Sea has what appears to be new ice. Based off the extent data, it looks like this year is indeed gonna be a bad refreeze. That's what I predict at least. The late crazy weather is almost behind us now. I expect refreeze to pick up after tomorrow, with the ice edge expanding rapidly towards the Atlantic, etc. With the exception of the CAA (edit-and Greenland Sea), at the moment 'refreeze' is nearly all wind driven and the ice is very mobile. Pacific side compaction likely to continue. Atlantic side dispersion likely to reverse after a couple of days north of Svalbard. Agreed, a lot of ice will flow through the Fram Strait. The CAB chart is crazy. But I believe it will hit the physical limit soon.